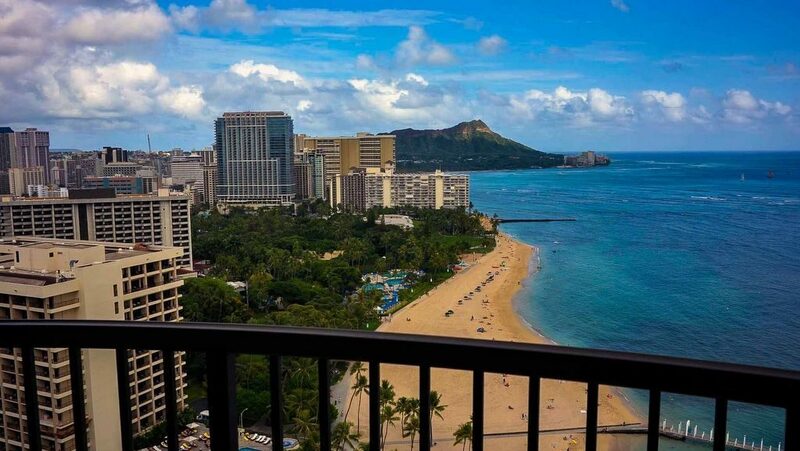 This view offers one of the reasons to visit Waikiki. There are plenty of good reasons why you should visit Waikiki. World renowned Waikiki is a nice blend of city life and serene ocean-side bliss. Even the air of Waikiki has a fresh sea breeze mixed with the delicious scent of tropical flowers. It is not hard to believe that many of the people who visit Waikiki end up coming back. Here are our top reasons why you will want to visit Waikiki on your next Hawaiian vacation. Beach view of the Waikiki Area. How often can you say you’ve lounged at a beach where an ancient volcanic cinder cone is part of the panoramic view? Diamond Head one of the most recognizable attractions in the region. But it also makes an inspiring backdrop for photos of you and your friends on the beach. Taking a sunset cruise near Waikiki is a stunning way to soak the starry nights and sparkling city skyline. 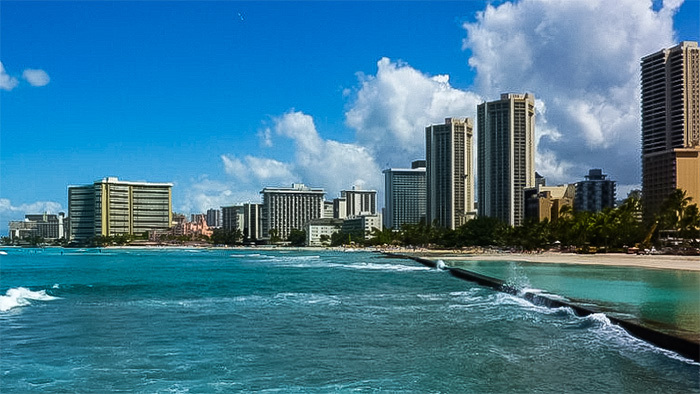 It is no wonder how Waikiki became celebrated as one of the most beautiful coastal areas in Hawaii. Waikiki is relatively crowded. But think of all the money you’ll save not having to rent a car. This area has been described as a walker’s heaven. Everything you could possibly need for a fabulous time is all in walking distance. Walking gives you an opportunity for exercise during your vacation as well as save you the cost of parking. Plus, going places by foot will help you justify having that extra serving of shave ice on a hot day. When you walk, you earn those holiday desserts. The good news is you can always catch a trolley, shuttle or bus if you need to give your feet a break. Waikiki is the ideal place to splash in the waves and try a whole slew of exciting adventures. Book your first surf lesson. Try wind surfing. Rent a kayak. Paddle a canoe. Go stand-up paddle boarding. Or even learn boogie boarding. Whatever ways you plan to enjoy the ocean, the options are limitless in Waikiki. Even if you are a land-lubber, there are many things to do in Waikiki not water related. For example, you can hike up to Diamond Head. Visit the Honolulu Zoo or Waikiki Aquarium. Or even enjoy a picnic at Kapiolani Park. You don’t have to be deep in the rain forests of Hawaii to enjoy some of the most glorious parts of nature. When on vacation, one of the primary priorities is to simply relax. For many, this entails sleeping in, taking leisurely walks, sipping cocktails or unwinding at the spa. Waikiki has a wealth of world class spas and resorts. Here, you can book a facial. Sit in a soothing mud bath. Soak in a mineral pool. Or have a couples massage right in your suite. Because there are many options, you can compare prices and find the best luxury deals in the area. 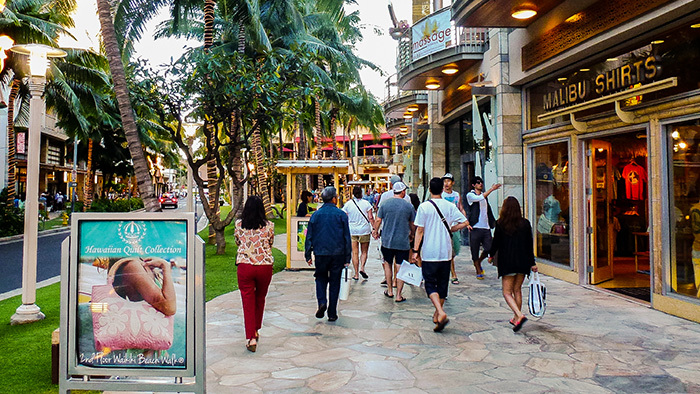 In Waikiki, you won’t struggle to find good food, unique atmospheres and quality entertainment. The nightlife scene might not be on everyone’s list of important elements in a vacation. But it is nice to have many options to dance or listen to live music if you want to. There are so many exciting family activities to choose from in Waikiki. Waikiki is a notably secure area where kids can safely play on the beach or run around the parks. Many restaurants cater to children. And a number of resorts offer family-oriented entertainment, classes, events and even on-site childcare.